GL is general purpose graphics programming. It is one of the most powerful APIs on the web and is capable of pretty much any kind of drawing you’d want to task it with (including, obviously, 3D graphics). I’d like to see more people doing stuff with the mighty WebGL. One of the ways we can do that is by having a thriving community of programmers creating modules for WebGL that solve tricky problems. This is what excites me about initiatives like GLSLify and Stack.gl. Resources like The Book of Shaders and WebGL Fundamentals can get you up and running with WebGL. This is not a WebGL tutorial. Sorry! Check the links above. It’s been done and I doubt I could do it better than them. This lack of organization makes learning WebGL difficult, But once you can see a shader as a program, and not voodoo, you’ll start thinking you can wield your own magic. A good structure to your WebGL code will definitely help. 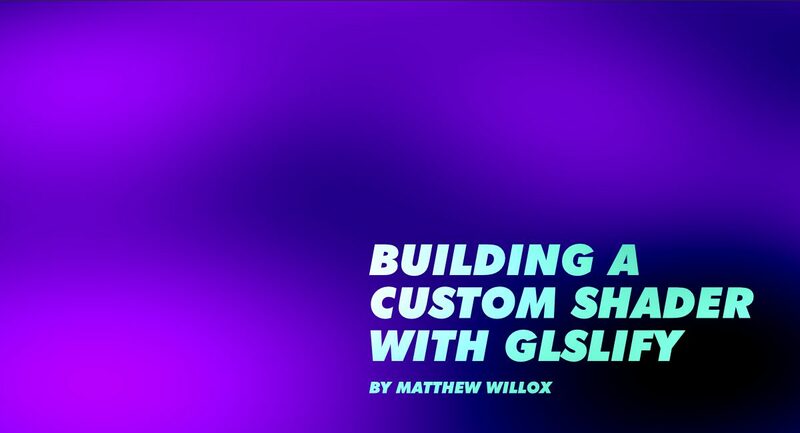 GLSLify helps structure your shader so that it’s organized, extensible, and reusable. ES6 and Node js have established good patterns for bundling together modules. They both support reusable modules and includes. WebGL shader code doesn’t have this. All your code needs to be in one big file. This is what GLSLify takes care of. It allows you to assemble a WebGL shader from imported modules. This lets you break up your code into small modules that are easier to understand. It enables better collaboration, source control, maintenance, and debugging. If you’re familiar with npm, browserify, and gulp, getting GLSLify setup is a piece of cake. If you just want the code, grab our GLSLify boilerplate from github. If you want a step by step walkthrough, Keep reading! Create a new folder for your project and initialize a new npm package (if you don’t know how to do that, follow these docs). To get started we’re going to need to get WebGL up and running. Doing this with the raw WebGL library is a ton of code. Luckily there is a small WebGL library called “TWGL” (twiggle) that reduces the amount of boilerplate significantly. We also need to setup GLSLify to compile our shader and send it to TWGL. Create a file called gulpfile.js in the project root. This will house our build task. When we run this task, browserify will use glslify to transform our separate glsl packages into compiled text. The two GLSL files will represent our main shader code. GLSLify will compile these into a string that will become our shader program. Let’s set up the index.js file to load the shaders. The glsl function glsl.file() can be used to load an external file. When this is compiled, it will be an inline string. Before we run the build, let’s put together a small shader so we can see the compiled version. In vertex.glsl, add the following code. Let’s not worry about what it does. This will take a vec3 as a thingToColor and a vec3 to tint it. Not very useful I know, but it’s for demonstration purposes. vec3 pos = vec3(st.xy, u_time); // travel along the Z-dimension in time. Ok, before we get to see these shaders, let’s get the build folder setup. Create a folder called dist. Inside dist create an index.html file. Now that everything’s in place, we can use the gulp build task we created earlier to build our script. Gulp will run the index.js file through a bunch of transforms and produce an app.js file in the dist folder. In order to run this, you’ll need a web server. A really simple web server to use is http-server. Once that is ready, run it from the dist folder. This should open a browser window with the compiled script running. Check the console. You should see two strings with our shaders printed out! You should also be able to spot our tint() function. Also notice that all the #pragma entries are gone. Compilation Magic! Let’s get the shaders actually working. To do this we will have to complete our setup of TWGL. Open up index.js again. This code will create the canvas and do the basic setup so that the shaders can run. Our compiled “inline” shader code will get passed to the GL program to run. Once the build is complete, refresh the page and you should see a pastel blue screen. Yay, we did it! Experiment with the tint values in the fragment.glsl file. Let’s have some fun with noise! Update fragment.glsl to import the glsl-noise the same way you did the tint.glsl. You might need to check glsl-noise docs to see all it has to offer. Glsl has a feature called “function overloading” which allows functions with the same name to have different signatures. You might need to check the types of data necessary to pass into a function and what data is returned. In this case the snoise3 (simplex noise 3D) function takes a vec3 and returns a float. #pragma glslify: snoise3 = require(glsl-noise/simplex/3d) // include some noise!!! // travel along the Z-dimension in time. Run gulp build one last time. Refresh the browser and enjoy the show! See the Pen Very Simple Custom Shader Build by Matthew Willox (@mwmwmw) on CodePen. If you have any trouble getting this working, grab the git repository and check it against your own work. I know it doesn’t look like much, but it’s got it where it counts. You should be able to start building the massive shader of your dreams knowing that it can remain clean, organized and digestible. If you have a great solution to a common WebGL problem, consider adding it as a Stack.gl package.